Silver Fir Tree (Abies Alba) aka European Silver Fir. 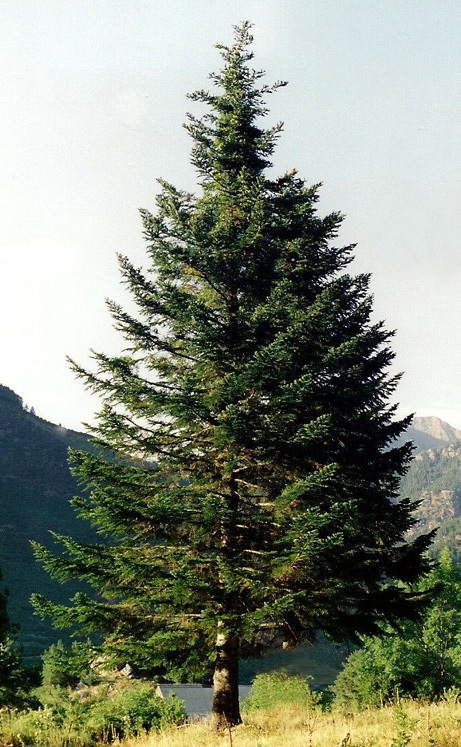 Originally native to Europe, the Silver Fir tree has decided to put down roots in the UK. Expect a final height of around 50m although some have been found at 60m. This might be because the tree measuring guy wasn't holding the edge of the tape properly or it just might be a freak of nature. Trunk diameter will be around 1.5m which is ideal for medium height tree huggers as you can just about give it a firm cuddle. Growth is a bit slower for the first 5-6 years but can then grow 1m or more per year. Moist valleys in Scotland, East Anglia and SW England show particularly favourable results. Best to plant them in their final position when less than 90cm as older trees will check quite badly (stall growing). Unlike many other fir trees the Abies Alba or Silver fir tree can be coppiced close to ground level and it will regrow from the stump. Usually found at over 500m on mountains however the growing range has been noted to be 300-1700m but of course the exception to the rule is one found at 1950 metres in the Pyrenees. Also noted that it seems to grow with Beech or Spruce trees. Trees that have grown particularly well seem to be found in well drained sandy loams, slightly acidic soil of around PH 5, North facing slope, cool climates and comparatively humid. Hardy to zone 4 it is considered suitable for UK growing. Although it performs very well in sandy loams, it can also be grown in medium loamy and heavy clay soils. Acid and neutral soils will not cause it to throw its teddy out the pram. Can grow in full or semi-shade and has been used to underplant. Stay away from infertile sandy, peat soils and overly windy sites. The Alba part in the name refers to the wood being white so if you talk to trees and want to know about the welfare of the tree then you can ask "are you all Alba?" This would literally translate to are you all white? (....groan) The wood is generally used for construction (plywood) and paper production. The wood is soft and quick to decay. 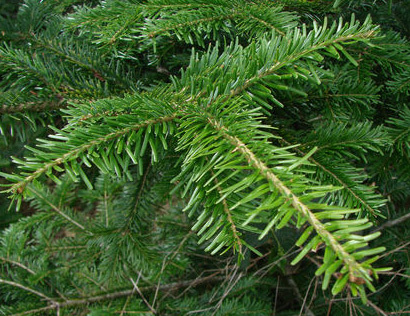 Silver Fir oil has soothing qualities and has been and is used in perfumes, turpentine, air fresheners, cough syrup, ship caulking, aerosol inhalants and perfumes. 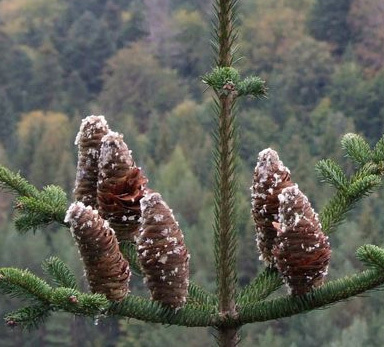 Although originally used as a Christmas tree it was ousted by Norway Spruce due to it being quicker and cheaper to grow. Don't expect to build an industry that is going to make you lots of money in the short terms as the tree generally needs to be over 60 years old to get sufficient quality and quantity. 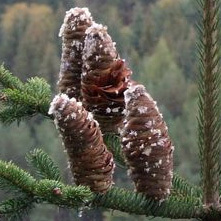 Abies Alba is sensitive to pollution and therefore a good environment indicator. So don't bother going online to buy a £5000 air quality meter, just buy a few trees from us, plant and wait a decade or three. The oldest Abies Alba (at the time of writing of course!) is a 411 year old tree found in 1952 in Bayerischer, Germany. Countries it is considered native to are Albania, Austria, Bulgaria, Czech Republic, France, Germany, Greece, Hungary, Italy, Montenegro, Poland, Romania,Serbia, Slovakia, Spain, Switzerland, Turkey and Ukraine. 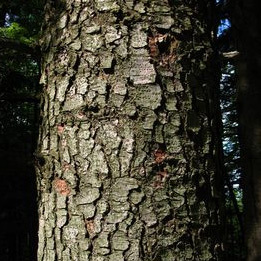 The inner bark is considered edible. Dry it out, grind into a powder and use as a thickening agent. For those looking for odd facts and figures, the dried weight of Abies Alba or Silver Fir is 415 kg per metre cubed, generally easy to work with, glues stains and finishes well and parts of the cone are food for the Tortrix moth.